Healthy blueberry muffins made soft and moist with healthy ingredients like Greek yogurt. Great for breakfast or as a snack. Originally published 6/27/16. Updated with new photos and tips 1/16/19. When I was a kid, my mom took me blueberry picking. Have you ever been blueberry picking? It’s hot, time-consuming work. You have to carefully pick each berry from the bush. All of the hard work was completely worth it because of all of the yummy things my mom would make with the blueberries – things like blueberry pancakes, blueberry cobbler, and blueberry muffins. I’ve always loved muffins, but blueberry muffins are one of my absolute favorites. 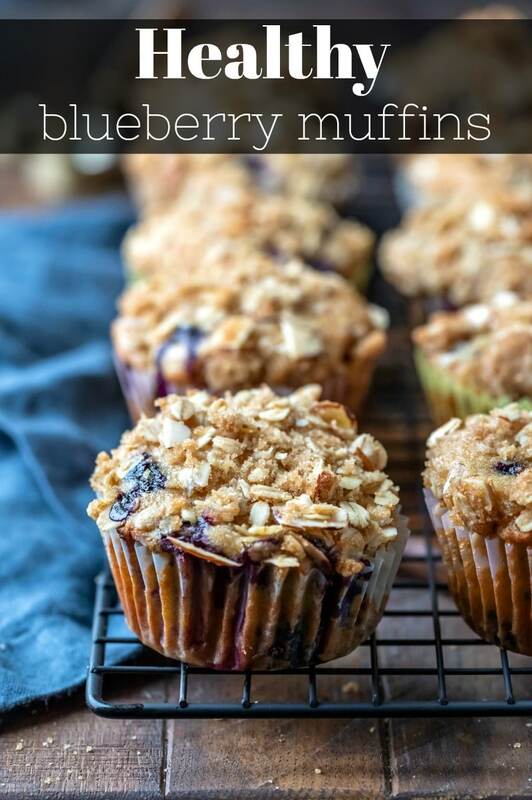 These healthy blueberry muffins are outstanding! They are moist and tender and filled with fresh, juicy blueberries. The whole-wheat flour is nearly undetectable in these muffins, and they are still super soft. 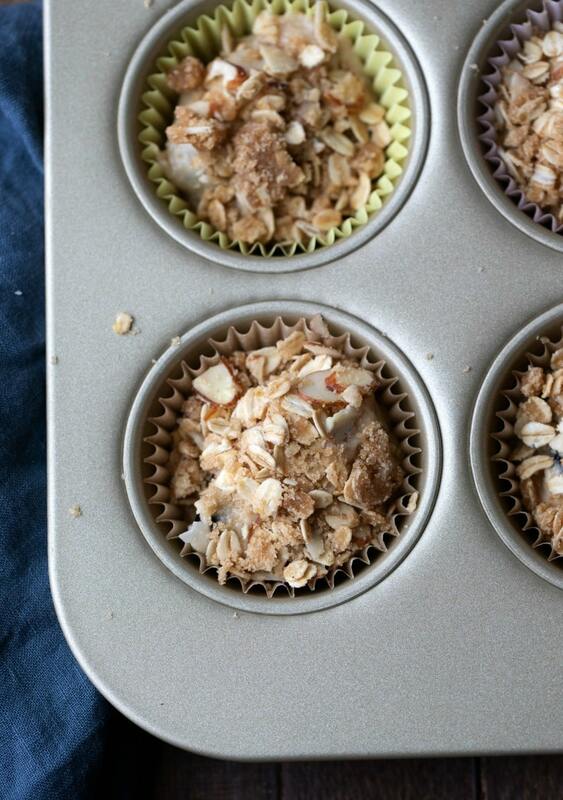 They’re also topped with a sweet, crunchy oat streusel for a little extra flavor. It’s optional, but I like the extra flavor and sweetness that it adds. Begin by mixing the dry topping ingredients together in a small bowl. Then, mix in the melted butter. 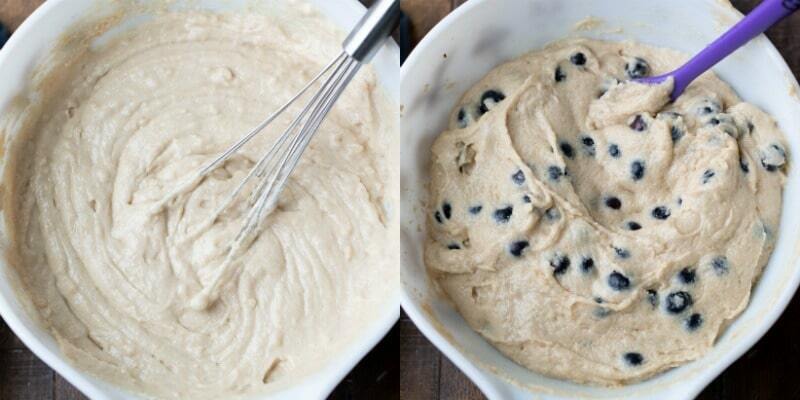 Set aside while you make the muffin batter. Next, whisk the milk and Greek yogurt together in a large bowl. Then, whisk in the oil and melted butter. Add the egg and vanilla, and whisk in until combined. Add in the dry ingredients, and whisk until combined. Fold in the blueberries just until incorporated. Divide the muffin batter among the prepared muffin cups. Then bake! What makes these muffins healthy? 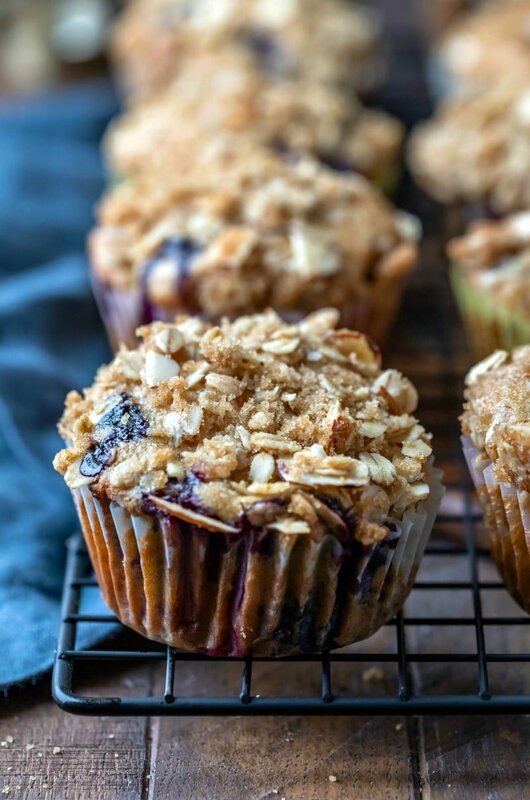 In order to make healthy blueberry muffins that are still moist and delicious, I use a sweet oat/nut crumble topping in place of part of the sugar in the muffins. I also cut a lot of the oil and use plain, non-fat Greek yogurt. I prefer non-fat Greek yogurt to applesauce in baked goods because it helps to keep the original texture and doesn’t make muffins or cake gummy the way that applesauce can. Also, whole-wheat flour stands in for the usual all-purpose flour in these muffins. I like to use a finely ground whole-wheat flour because I find it works well in everything from cookies to muffins. If you prefer, you can use part or even all all-purpose flour in this recipe. How do you make moist blueberry muffins? Normally, blueberry muffins rely on quite a bit of fat – either butter or oil – to make them moist. There’s still some oil and butter in these muffins, but part of the usual fat has been replaced by the Greek yogurt. 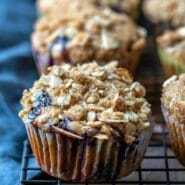 If you’ve tried this healthy blueberry muffin recipe, don’t forget to rate the recipe and leave me a comment below. I love to hear from people who’ve made my recipes! You can SUBSCRIBE to receive my latest recipe newsletters or FOLLOW ME on FACEBOOK, INSTAGRAM and PINTEREST for even more delicious food. 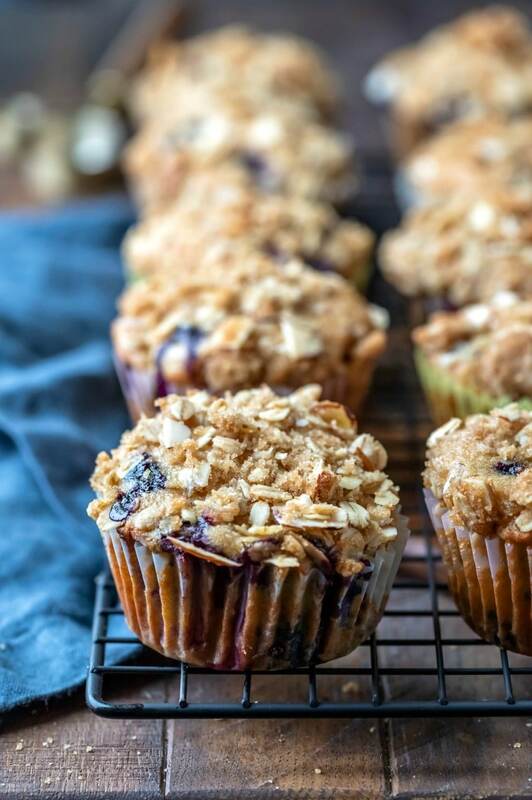 Moist blueberry muffins made with healthy ingredients like whole wheat flour and Greek yogurt. Preheat oven to 425 F. Place 12 muffin cup liners in muffin tin. Lightly grease liners with non-stick cooking spray. 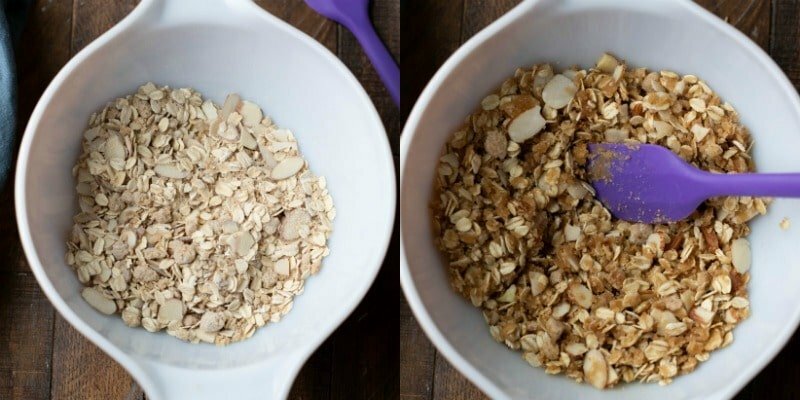 To make topping, combine oats, brown sugar, flour, and cinnamon in a bowl. Stir in 1 tablespoon melted butter until combined. Reserve remaining melted butter. 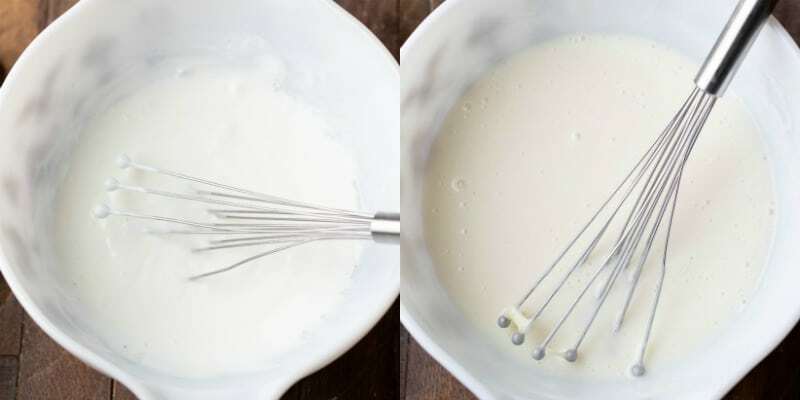 In a large bowl, whisk Greek yogurt and milk together until combined. Whisk in oil and reserved melted butter until combined. Add vanilla and egg, and whisk in until combined. Whisk in dry ingredients just until incorporated. Do not overmix. Sprinkle topping evenly over muffin batter, if using. Bake at 425 F for 5 minutes. Reduce oven temperature to 375 F; bake an additional 13 minutes, or until a wooden pick inserted in center comes out clean. Cool muffins in pan for 5 minutes. Remove from pan; cool completely on a wire rack. If omitting the topping, I recommend using vanilla non-fat Greek yogurt for additional sweetness and flavor. Anything from skim to whole milk will work. I use finely ground whole-wheat flour. I've also used white whole-wheat flour. If you prefer, you can use all-purpose flour or half whole wheat and half all-purpose flour. Nutrition values per muffin without topping: 199 kcal, 7 g fat, 29 g carbs, 5 g protein, 14 g sugar. 2 cups minus ? ?how many tablespoons whole wheat flour??? Thank you! I’m not sure how that disappeared. It should read “2 cups minus 2 tablespoons” and has been corrected. Thanks again! I have blackberries on hand. Do you think they’d work OK to substitute for the blackberries? These muffins look amazing! Yay for blueberry season! I’m sure these are great with a cup of coffee! I think I’ve found breakfast heaven. No better way to start the day with a muffin that’s this gorgeous and looks this delish! I’ve gotta try this one!